On November 7th, 2017, the Manhattan Beach City Council passed legislation that will add sharrows to many streets in Manhattan Beach. The South Bay Bicycle Coalition was instrumental in pushing this legislation through and we are overjoyed that it was passed. During the meeting, the president of the SBBC, Charlene Dipaola, gave a great speech on the need for sharrows in Manhattan Beach. She referenced the growing need for sharrows for schoolchildren and casual bicyclists. 11 miles of sharrows were approved by the city council, which means that about half of the South Bay Bike Master Plan was implemented. We also had a lot of residents show up and support the passing of this legislation. Without them, our argument would not have been as convincing as it was, so we thank all of them for coming. For more information on this event, visit the links below. Click here for a map of the proposed sharrows. 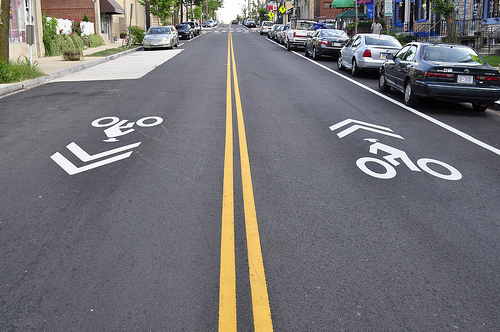 Click here for a list of roads that will have sharrows added to them. Click here for an easy reader article covering this meeting. Click here for the SBBC master plan.